I've been delinquent. And I got called out on it this past weekend. 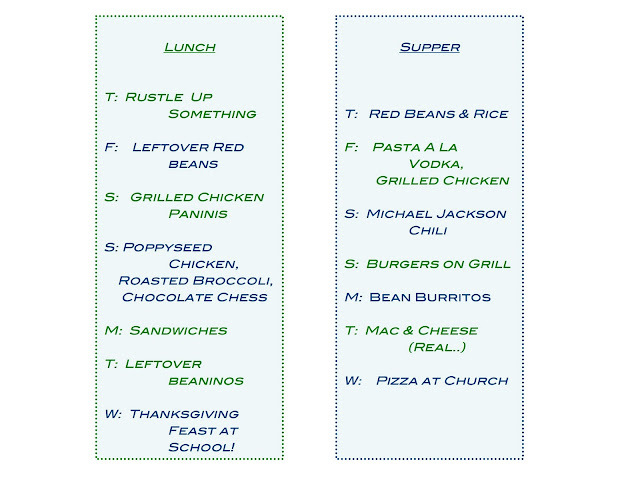 So, this is what we're eating this week. Today, I've no idea what we're going to eat for lunch. Maybe some noodles with butter and parmesan? I think it needs to be hot whatever it is. Red Beans doing their quick soak right now for tonight. I might surprise my sweet husband and actually get sausage to go with them. The man loves him some sausage. Tomorrow, we'll glory in day old red beans - the best kind. Tomorrow night, I'm making one of my favorite pasta sauces - vodka sauce. How can you go wrong with red pepper, tomatoes, vodka and cream? Answer: you cannot. I'm also going to grill some chicken. We have some friends coming to eat, and I'm always reluctant to plop in front of guests a vegetarian meal. Unless I know they'd appreciate that as much as I do. But people, especially men, tend to think that supper isn't supper without meat. They're wrong, of course, but hospitality is incompatible with trying to make a point. Or at least point-making should take a back seat. Saturday, we'll take the grilled chicken and some Sam's Club hoagies and have a hot lunch. Saturday night, we're going to have a big pot of Michael Jackson Chili. A black and white bean feast is what it is. We're going to be at my daddy's cabin in the woods, so we're also having smores. And probably a green salad, blah blah blah. Sunday, we have our monthly church potluck. I'm taking poppyseed chicken, which has no redeeming nutritional value, but tastes so good. Sunday night, burgers on the grill. I've been wanting them for weeks! Monday lunch, sandwiches in lunch boxes. Monday supper: Glory of glories. Tuesday lunch: leftover bean burritos from monday. My baby girl, when she was little bitty, ate a lot of bean burritos (it's a forster requirement). She started saying "More bean- neeno- please." We still call them beaninos. Tuesday supper: Homemade mac and cheese. I've also been wanting this. I think I may look for a new fun recipe to try. 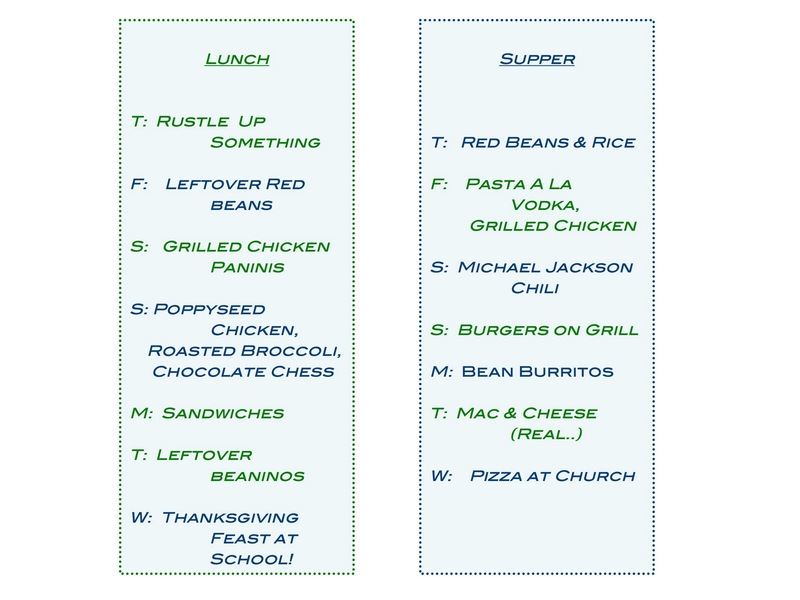 Wednesday lunch: We have our thanksgiving feast at school! I'm in charge of fruit salad and mashed potatoes. One I'm excited about. Guess which. I think I'm also roasting a turkey. Still waiting to hear. If I am, I'll use an overnight recipe in Come On In which is really moist, though not super impressive looking. Wednesday supper: Dominoes Pizza! My friend Ragan's favorite.